Graham Cashion and Christine Booth operate Tin Dragon Cottages using 100% renewable energy. 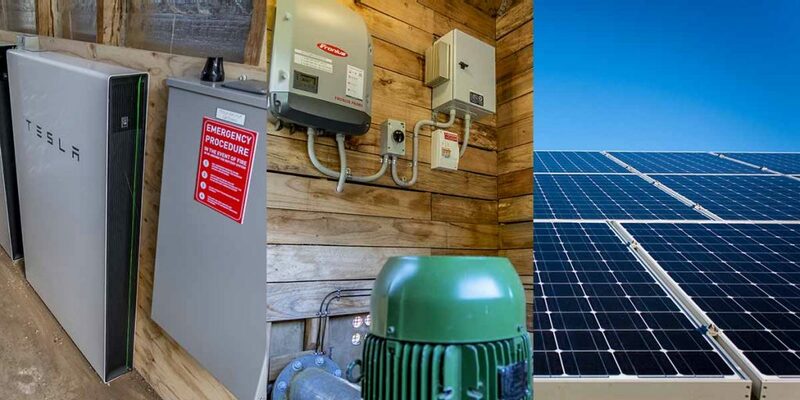 You can learn how their grid-connected storage system provides all their power needs. **This is the preliminary program. The final program will be available closer to September. The integrated renewable energy system at Tin Dragon Cottages was designed and built by Graham Cashion, Paul Coull and Martin Dingemanse. They will showcase Tin Dragon Cottages’ sustainable energy initiative. Of course, they will be delighted to get you started with your own renewable energy project, too! Martin’s aim is to provide the best and most efficient renewable energy systems that will stand the test of time and help power our world in a sustainable manner for years to come . Martin qualified as an A-Grade Electrician in 2001. He went on to complete a Diploma in Electrical Engineering through TasTafe, with further studies specialising in Renewable Energy Engineering through Tafe Queensland. After completing his studies, Martin worked as Project Manager for a large Design & Engineering Company specialising in industrial and agricultural applications. Then in 2005 he and his wife Margaret started their own specialist renewable energy business, MODE Electrical. Martin is a registered Electrical Contractor and qualified CEC-Approved Installer & Designer (GC/SPS). He specialises in engineered renewable energy solutions for agricultural, commercial, and domestic applications in Tasmania and beyond. Martin’s passion for providing life-saving services for needy communities lead him to Africa in 2014 and 2016. Here Mode Electric built award-winning stand-alone systems for two different hospitals at Yei and Nzara, in South Sudan. 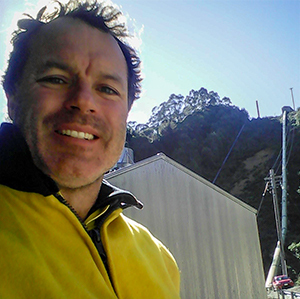 Paul operates his own business as a freelance hydropower engineer and renewable energy consultant. He is also a supplier and installer of quality hydropower and renewable energy equipment. His qualifications include Bachelor of Engineering with 1st class Honours (Renewable Energy) and Fitter and Machinist (Trade Certificate). Paul has broad experience in the renewable energy field in hands-on engineering, project management, installation and commissioning. Furthermore he is one of the recognised small hydro experts in Australia. As an Engineer, Paul has significant experience in greenfield and retrofitted hydropower projects, hydropower electrical and mechanical equipment specification, hydropower scheme design, fault-finding and maintenance of hydropower equipment, and hydropower project development. 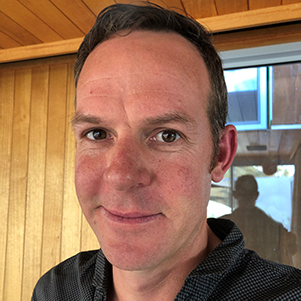 Paul’s experience includes: isolated village electrification, grid connected generation, energy recovery from water systems and technical management of a national renewable energy project. Paul has also worked in remote locations including Central Australia, Papua New Guinea, Zimbabwe, Micronesia, and Canada. 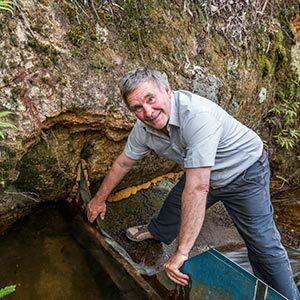 Graham’s dream was to construct a micro-hydro system to provide sustainable power for Tin Dragon Cottages. Then in 2018 his dream was realised when Tin Dragon Cottages became carbon positive! Graham has the practical knowledge and skills of a qualified fitter-machinist and successful building contractor of more than 25 years. His love of all things hydro began with his apprenticeship with the Hydro Electric Commission. Graham will be pleased to share his knowledge with you. In particular he will explain how he planned and executed the Tin Dragon micro-hydro project. Of course Graham also learned many valuable lessons along the way. I hope my experience can help you avoid some of the potential pitfalls in pursuing your own renewable energy dream! Our local resident foodies have put together a menu featuring the best of North East Tasmanian produce and wines. You will be guaranteed an evening of epicurean delights! Trailhead Food Co is the brainchild of Mark and Julia Cornish. 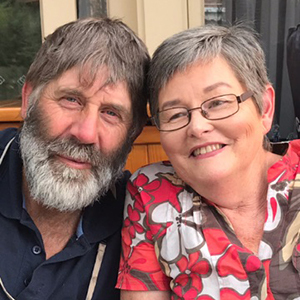 They moved to Tasmania almost 2 years ago, and immediately felt they were home. 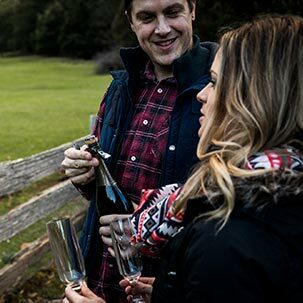 With such an abundance of amazing food, beer and wine at their doorstep, they were inspired by the culinary wonderland that is North East Tasmania. Mark and Julia wanted to create a catering company that would satisfy even the most demanding foodies – and they have done just that! Since 2017, they have delighted their customers with delicious, innovative food. They pride ourselves on pleasing the most diverse and picky palates on a budget, and their customers keep coming back for more! At Trailhead Food Co. we are passionate about good food. Gail and Michael are local farmers. Michael has had a lifetime commitment to farming and has lived in the North-East all his life. So he knows most of the local food producers by first name. On Saturday night, Michael will share some of their stories with you. So your dinner will be a paddock-to-plate experience. Both Gail and Michael have a strong interest in food. Gail is a regular baker, baking bread from wheat varieties sourced in the North-East. She is an extraordinary food experimentalist who works with locally-grown foods, including native plant foods. Michael and Gail grow and preserve our own produce. They have a diverse range of pursuits/hobbies from beekeeping, fruit growing, breadmaking and charcuterie. We want to share with you some amazing local foods and the stories behind them!